Welcome to A case of the Mondays. There’s always a lot going on during the weekend. If you weren’t lucky enough to spend the past two days on the couch, you can catch up on the top five sports items you may have missed here. No. 1 – Seahawks ticket scandal? : The story of how the Seahawks are blocking 49ers fans from attending the NFC Championship Game in Seattle became big news over the weekend. Tickets for the 49ers-Seahawks game went on sale Monday, but only to residents of the Pacific Northwest. Many 49ers fans are offended and Bay Area media outlets are calling the move by the Seahawks a “controversial” decision. In reality, it’s a standard practice. 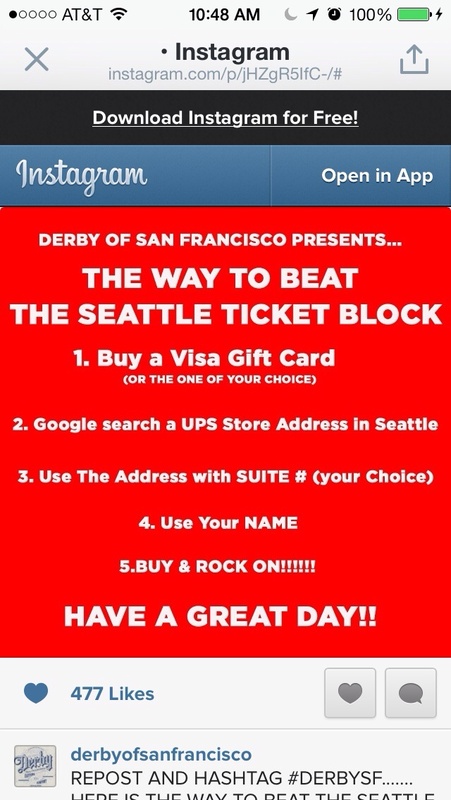 The Denver Broncos are doing the exact same thing with tickets to the AFC Championship Game. They do this to prevent ticket scalpers from buying up all the seats and selling them on secondhand markets. There are still thousands of tickets available online. It’s really much ado about nothing. Especially because 49ers fans are smart and found a way to beat the system. No. 2 – Jim Harbaugh stole the show: The 49ers’ coach was a sight to behold as his team defeated the Panthers 23-10 on Sunday. He didn’t issue any postgame hugs or kisses to beat writers, but he did a pirouette on the sidelines and ran onto the field during the initially blown call on Vernon Davis’ touchdown reception. In a particularly funny moment, Harbaugh had to be restrained by wide receiver Anquan Boldin before the officials determined that Davis did indeed make the catch with both feet inbounds. Harbaugh promises enthusiasm unknown to mankind, and he sure delivers. Most of the attention will go to Colin Kaepernick for stealing Cam Newton’s touchdown celebration, but the coach stole the show. No. 3 – Is there anything Stephen Curry can’t do? : The Bay Area may have their next multi-sport star. After the Warriors’ 99-97 win over the Boston Celtics on Friday, Stephen Curry put on an Oakland Athletics hat and played a little stickball in the locker room. Curry hit the game-winning shot on the court, and made what looks like a game-saving catch off the court. No. 4 – From ‘Kaepernicking’ to reporting: Speaking of duel threats, check out what Kaepernick did after the 49ers game. The young quarterback grabbed a pen and a notepad and hopped into the media scrum to help interview Boldin. Trust us, Colin. You’ll want to stick to football. It pays much better. — The Seattle Aquarium has a crab named Marshawn Pinch. What’s next? A lion at the San Francisco Zoo named Frank Roar? — There may be a Skittles shortage in Seattle soon. The favorite candy of Seahawks running back Marshawn Lynch is served with hamburgers, sprinkled on players after scoring, and even thrown into the end zone in bulk quantities. — LeBron James is following in Ric Flair’s footsteps and hopping on the 49ers’ bandwagon. Congrats to my homie @DonteWhitner on the game clinching INT and W! Since my Cowboys out I want him to win it all!